DinoPC has teamed up with Asus Strix and Corsair to gift one of their fans with amazing gaming PC! 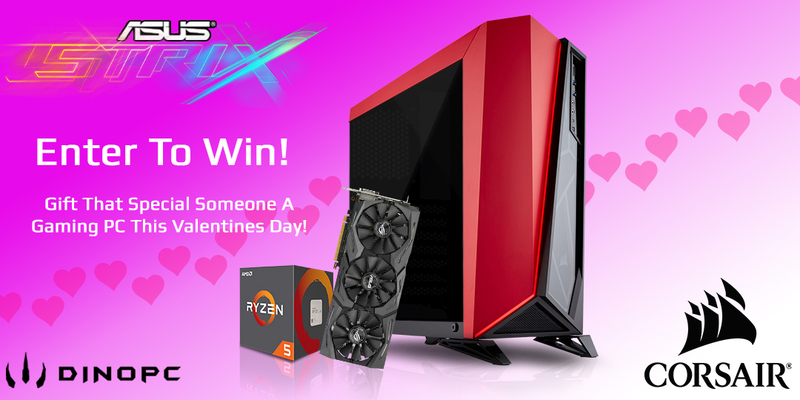 To enter in this Valentines Day 2018 Gaming PC Giveaway grab your free entries by following few simple steps listed down below! The Carbide Series SPEC-OMEGA is a mid-tower PC case with striking angular looks, unique tempered glass front and side panels and Direct Airflow Path cooling layout. It’s the ultimate SPEC. Ensure your system will always stand out – asymmetrical, angular design gives SPEC-OMEGA a bold, unique and dynamic look. Why hide your system? Tempered glass side and front panels put your system on display unlike any other case. Keep your system cool inside and out with two CORSAIR SP120 fans that deliver airflow to your hottest components. With your system on display, SPEC-OMEGA makes it easy to keep your cable routing neat, tidy, and out of the airflow path for better cooling.